I am merging the two blogs that I write. The new website will be http://www.jamiethelibrarian.com, which, in the past, I have only used for Harvest Park Library news and book-related news. Please bookmark this website to stay in touch with the book reviews that I do and also Harvest Park Library and other book-related news. Part biography, part science, part history, this provocatively titled book takes readers from the Industrial Revolution through today, explaining how Darwin developed his theory of evolution. Darwin never actually used the term “evolution”-he most often used the phrase “descent with modification” to describe his theory. 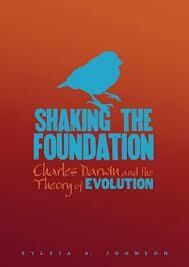 His theory “shook the foundation” of long-held religious beliefs and scientific theories. Many important and interesting primary source photos, illustrations, and diagrams, as well as interesting sidebars, add to the accessible and well-written text. In eight chapters, Johnson presents the information in a factual, informative style. Johnson also discusses transmutation, uniformitarianism, eugenics, social darwinism, and intelligent design. Backmatter includes a glossary, source notes, selected bibliography, suggested reading, and an index. This book is not yet available at the Harvest Park Library, but will hopefully be added in May, 2013. U.S. Army Major William Sumner, trained in archeology, went to war-torn Iraq in 2003 to restore the Iraqi cultural heritage. 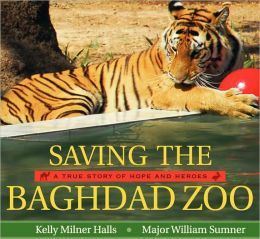 But when the need arose for him to help save the abandoned animals at the Baghdad Zoo, and other local zoos, his mission changed. This photo essay may initially draw readers in by the fascinating color photographs, but the text is as impressive. Each short chapter focuses on a different animal that was saved; from pelicans to bears, and even dogs. Sidebars provide additional interesting information. Whether for or against the war, the animals plight is an ultimately uplifting story of how people from different cultures can come together to make a difference. This book is not available at the Harvest Park Library. Do you want it to be added? If so, please let me know! 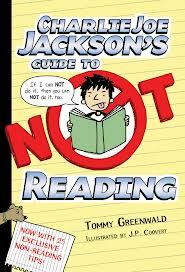 This third book in the Charlie Joe Jackson series (Charlie Joe Jackson’s Guide to Not Reading, 2011, and Charlie Joe Jackson’s Guide to Extra Credit, 2012) is a winner. Entertaining, substantive, and endearing, Charlie Joe, in a moment of weakness, agrees to be sent to Camp Rituhbukkee (pronounced “Read-a-Bookie”). Once there, he will do anything to get the nerdy campers to be less nerdy, and more like him. Charlie Joe becomes an unlikely leader and it turns out he has more integrity than he thought. Interspersed with complimentary black and white illustrations and letters to and from friends back home, reluctant and avid readers alike will enjoy Charlie Joe’s summer vacation. This series is good for readers who are ready for the next step up from The Diary of a Wimpy Kid series. Review based on an ARC. This book will be published on May 14, 2013. It will be added to the Harvest Park Library then! Applegate, Katherine. The One and Only Ivan. Patricia Castelao, illus. I was tempted to give this book 3.5 stars because the first half of the book was a little slow and predictable. The last third, however, was a page-turner and was excellent. I really wanted to keep reading to find out what happened to all the characters. There is plenty of white space on each page, so even though it’s about 300 pages, it reads fast. Even though this book was a work of fiction, it was based on a real-life gorilla. I got so wrapped up in the story, that at the end I wished there had been a call to action or a list of resources of how I can help. Aman and his mother escape Afghanistan with the help of Shadow, an Army sniffer dog, to live in England. After living in England for six years, they are denied asylum and have to go back to Afghanistan. Aman’s best friend in England, Matt, asks his grandfather to go to the immigration removal center to talk with Aman. Aman tells Matt’s grandfather his harrowing story. Outraged, Matt’s grandfather knows he has to do something to get Aman and his mother granted asylum. This middle grade war story, originally published in Great Britain in 2010, is braided with compassion, brutality, and perseverance. Morpurgo, whose many books are often about war and animals, has postscript information about the Afghanistan War, sniffer dogs, and the Yarl’s Wood immigration removal center.